Why Food Is More Than Just What You Find On Your Plate - Welcome to SarahKesseli.com! Did you know that your ‘food’ is more than what is just on your plate? Other factors such as healthy relationships, religion/faith, satisfying career, self care and physical activity help make your life more fulfilling. When these ‘primary’ foods are fed and nurtured, it makes your food secondary in life. 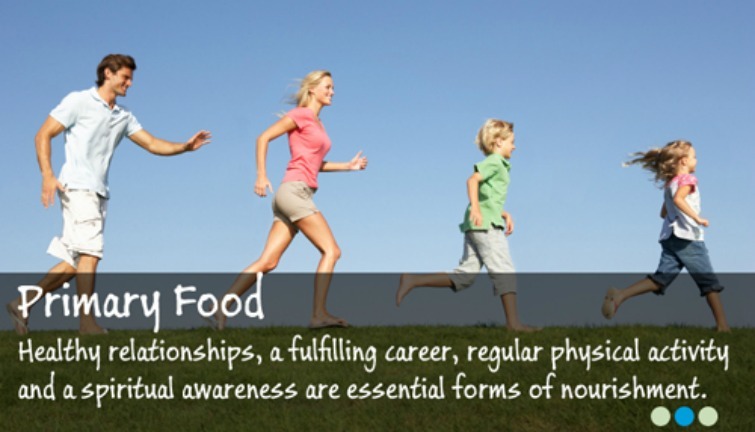 Have you ever noticed when a relationship is not doing well, you turn to or away from food? But you are always thinking about how that damaged relationship is impacting the food you eat (aka “I’m so stressed! I am just eating and my pants are starting to feel tight!” or “I am so upset I can’t even eat”). Or have you noticed that when you are incorporating regular physical activity into your life that you don’t need to be so “food obsessed”? Your weight stays in a comfortable range and you enjoy life. So when was the last time that you really sat down and took a look at your primary foods? Do you even know if they are satisfying you? What areas do you think you could work on improving? What areas do you feel are exactly where you would like them to be? Take a few minutes tonight and write it down. Put a few bullets under each topic and see if that area is satisfying your life. When you find the spot that needs improvement, let me know! Let’s commit together to improving that part of your life one step at a time! Because who doesn’t want to live a WHOLE and FULFILLING life?